Claudio Abbado's career with Deutsche Grammophon stretches back over more than four decades. In that time he made innumerable recordings which still remain unsurpassed on record - classics right from the start. Abbado inspired levels of commitment and communication from his musicians that resulted in performances and recordings that stand the test of time. Abbado was as much a man of the theatre as he was one of the greatest of all late 20th century symphonic conductors. Opera was central to all his orchestral posts, with three great composers forming the major pillars of his recorded opera legacy: Mozart, Rossini and Verdi. Throughout his recorded legacy, the listener feels a real sense that characters are thought through in great detail and Abbado conducts with an obvious love for the music but also with a flexibility informed from the drama of the moment. 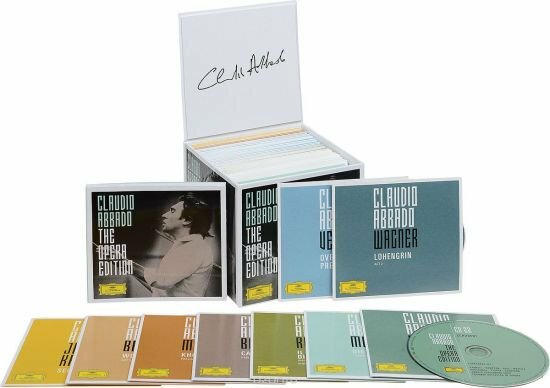 Claudio Abbado The Opera Edition is testimony to an extraordinary operatic legacy and a memorial to a truly great maestro.